To assert that the UK is a maritime nation is something of a cliché, but since our nation is an island and depends on seaborne goods for our survival, it can also be said to be true. Amongst other things, that would imply that the UK needs a maritime policy, or a series of policies covering matters maritime which collectively add up to a maritime policy. Putting all those policies together, one might even call it an Integrated Maritime Policy (IMP), except for the fact that the EU has got there first. Its fingerprints on this issue can be seen as early as September 1991, which brought the first formal intervention of the Commission into the domain, with COM (91) 335 entitled "New Challenges for Maritime Industries". In this document, the Commission defined the framework in which a coherent approach to the maritime industries should be implemented, those industries including shipping, shipbuilding, the service sector, marine equipment and the "resources of the sea" industry, including fishing. The following year, 1992, saw a milestone in the development of EU policy, in Council Regulation (EEC) No 3577/92, applying the principle of freedom to provide services to maritime transport within Member States (maritime cabotage). As from 1 January 1993, freedom to provide maritime transport services within a Member State (maritime cabotage) applied to all Community shipowners who had their ships registered in, and flying the flag of a Member State. This was regarded as an important element in completing the Single Market, ensuring the freedom to provide services. Demonstrating continued activity, the Commission 1993 published COM 93/66 on proposals for a "Common Policy on Safe Seas". In an 81-page document, it set out an a "proposed action programme for enhancing safety in maritime transport". The year 1995 then saw a major piece of legislation in the policy domain in the form of Council Directive 95/21/EC, the so-called Port-State directive, obediently transposed by the UK Government intodomestic law the Merchant Shipping (Port State Control) Regulations 1995. The next year, in March 1996, the Commission then published COM (96) 81 final, betraying much grander ambitions with the heading: "Towards a new maritime strategy", addressing "the problems of the competitiveness of EC shipping". Alongside this came COM (96) 84 final on "Shaping Europe's Maritime Future", in which the commission investigated the structure and situation of "the European maritime industries" and outlined "which policy elements and initiatives it considered suitable to contribute to their industrial competitiveness". These communications invoked a response in the form of a Council Resolution on 24 March 1997, endorsing the new strategy. The Commission had been given a green light by the Member States. In addition to these high level policy issues, though, we also saw the drumbeat of routine legislation, implementing provisions agreed at global level through the International Maritime Organisation (IMO) and other bodies. An example of this came in 2001, with the passing of Directive 2001/96/EC, "establishing harmonised requirements and procedures for the safe loading and unloading of bulk carriers". This put into effect the recently agreed IMO Code of Practice known as "the BLUCode". Such measures would have been adopted by the UK, irrespective of EU involvement. What then gave EU policy development a considerable boost was the sinking of the oil tanker Erika in December 1999, releasing thousands of tons of oil, polluting miles of the Brittany coast. It took just twelve months for the Commission to respond with COM(2000)802 final with a series of measures which included the establishment of a European Maritime Safety Agency (EMSA). This got the go-ahead in 2002, with Regulation (EC) No 1406/2002, together with Directive 2002/59/EC establishing a Community vessel traffic monitoring and information system. Its purpose was to enhance the safety of efficiency of maritime traffic, "improving the response of authorities to incidents, accidents or potentially dangerous situations at sea, including search and rescue operations, and contributing to a better prevention and detection of pollution by ships". When EMSA became operational in 2003, it was decided that it take responsibility for setting-up and operating the new vessel traffic and monitoring system, which would be called SafeSeaNet. Setting-up commenced in October 2004 and the system became fully operational in 2009. Before even EMSA had ordered the office furniture, though, EU maritime policy ambitions got a further boost when, on 19 November 2002, the Liberian tanker MV Prestige sunk off the coast of northwestern Spain, releasing over 20 million US gallons of oil into the sea, polluting stretches of the Spanish, Portuguese and French coastlines. By now, though, the EU was planning its strategic objectives to the end of the decade, which the commission published in COM(2005) 12 final, declaring that there was "a particular need for an all-embracing maritime policy aimed at developing a thriving maritime economy and the full potential of sea-based activity in an environmentally sustainable manner". This spawned in 2006, COM(2006) 275 final (with Annex), a Green Paper entitled: "Towards a future Maritime Policy for the Union. This was: "A European vision for the oceans and seas". With "sustainable development" high up on the agenda, the aim was "to launch a debate about a future Maritime Policy for the EU that treats the oceans and seas in a holistic way". The year 2007 them saw the publication of COM(2007) 575 final offering: "An Integrated Maritime Policy for the European Union". This, said the Commission, "lays the foundation for the governance framework and cross-sectoral tools necessary for an EU Integrated Maritime Policy and sets out the main actions that the Commission will pursue during the course of this mandate". Since then, the Commission has been actively pursuing the development of maritime policy. Building on what was then 16 years of policy activism, it has since initiated a number of schemes, growing the institutional and legislative framework, a process which continue up to the point that the UK leaves the EU and beyond. Immediately post-Brexit, a newly independent UK will have been removed from the policy-making sphere in maritime matters for nearly thirty years and, although it has been an active member of the IMO, will be struggling to make up for lost time. On the face of it therefore, as a short-cut to a working policy, maritime regulation would be an obvious candidate for repatriation via the Great Repeal Bill (after its Royal Assent). This, if the Government's theory stands up, means that "the same rules and laws will apply on the day after we leave the EU as they did before". However, as we pointed out yesterday (and many times before) simply adopting EU regulations concerning maritime policy isn't going to work. The EU instruments are devoted to setting up EU structures and systems which are not easily (or at all) transportable to a UK legislative environment. We need to be building up our own policies, and then devising the legislation and other instruments to put them into effect. We cannot use EU law, designed to put into effect European policies throughout the EEA, to implement policies applicable specifically and exclusively to the UK. To try to do so is like using spanners to carve wood. take steps towards a more interoperable surveillance system to bring together existing monitoring and tracking systems used for maritime safety and security, protection of the marine environment, fisheries control, control of external borders and other law enforcement activities. The parameters were set out in more detail in late 2009, via COM(2009)538 final. Headed, "Towards the integration of maritime surveillance: A common information sharing environment for the EU maritime domain", its aim was to develop a surveillance programme that would generate situational awareness of activities at sea "impacting on maritime safety and security, border control, the marine environment, fisheries control, trade and economic interests of the European Union as well as general law enforcement and defence so as to facilitate sound decision making". There was, the Commission asserted, a clear need to share maritime surveillance information. 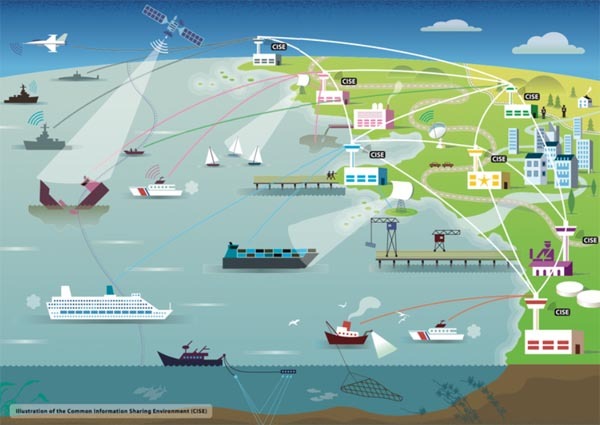 Different sectoral authorities dealing with monitoring and surveillance of actions at sea gathered data and operational information so as to establish the best possible maritime awareness picture for their own use. But, for many user communities, this picture did not include complementary information gathered by other sectoral users due to the lack of mutual exchange. With undeniable logic, therefore, the Commission argued that developing the necessary means to allow for such data and information exchange "should enhance the different users' awareness picture". Such enhanced pictures, it said, "will increase the efficiency of Member States' authorities and improve cost effectiveness". The objective of the programme, therefore, was to set out guiding principles for the development of a common information sharing environment and to launch a process towards its establishment. The accompanying staff working document then set out a complex of measures to be taken at European level, to make the system work. Already that year, though, there had been published Directive 2009/17/EC, amending Directive 2002/59/EC establishing a Community vessel monitoring and information system. This highly technical measure was to re-emerge two years later, when the Commission complained that the UK had not fully implemented the Directive (along with eight other States which had not implemented it at all). Then, in 2010, the Commission published a "roadmap" setting out the functional requirements for what it was now calling the "Common Information Sharing Environment" (CISE) for the surveillance of the "EU maritime domain". It stressed the passive nature of the project, declaring that "Integrated Maritime Surveillance" was about "providing authorities interested or active in maritime surveillance with ways to exchange information and data". In June 2014, however, the surveillance programme became part of the EU's Maritime Security Strategy (EUMSS), thus acquiring an identifiable military dimension. The primary objective was to provide a common framework for relevant authorities at national and European levels to ensure coherent development of their specific policies and a European response to maritime threats and risks. A secondary aim was "to protect EU's strategic maritime interests and identify options to do so". It thus significantly strengthened the link between internal and external security aspects of the maritime policy of the EU and civil and military cooperation. In a joint communication from the European Commission and the High Representative for external affairs, the tasks of the EUMSS were set out. It was required to ensure an optimal response to threats, support the relevant authorities and agencies at all levels in their efforts to enhance the efficiency of maritime security and to facilitate cross-sectoral and cross-border cooperation among maritime security stakeholders. The strategy was thus intended to position the EU as a credible, reliable and effective partner in the global maritime domain, ready and able to take on its international responsibilities. As with the surveillance programme, great stress was placed on a cost-efficient approach to maritime security. The EU's maritime security is largely organised around national systems and sector-specific approaches that potentially render operations more expensive and less efficient. Maritime operations should be made more efficient by improving cross-sectoral cooperation, enabling better communication between national and EU-systems, creating effective civil-military interfaces and by translating results from research and technological development into policy. By July 2014, a month after the announcement on the Maritime Security Strategy, the Commission was in a position to set out further views on the surveillance programme, having Maria Damanaki, Commissioner for Maritime Affairs and Fisheries, argue that savings of €400 million per year could be made through increased cooperation and sharing of data. Sharing such information was vital to avoiding duplication of effort. About 40 percent of information was collected several times and 40-80 percent of information was not shared amongst the interested users. In pursuit of its plans, the Commission set out eight further steps required to give shape to the CISE, and to bring systems to fruition, culminating by 2018 in the launch of a review process to assess the feasibility of implementation and the need for further action. Maritime CISE is a voluntary collaborative process in the European Union seeking to further enhance and promote relevant information sharing between authorities involved in maritime surveillance. It is not replacing or duplicating but building on existing information exchange and sharing systems and platforms. Its ultimate aim is to increase the efficiency, quality, responsiveness and coordination of surveillance operations in the European maritime domain and to promote innovation, for the prosperity and security of the EU and its citizens. Untypically, therefore, the Commission averred that "the operational aspects of such information exchange" needed to be "decentralised to a large extent to national authorities in line with the principle of subsidiarity". On this basis, CISE as a project seems largely benign, and the timescale is such that it could be coming into effect around the same time that Brexit takes effect. On paper, (as expressed in 2014), the UK Government supports the initiative, aiming to play "a leading role" in developing it. As part of the Brexit negotiations, therefore – and the internal policy discussions which will inform them – the UK will have to decide whether it wants to continue with this programme. In the context, the Great Repeal Bill is an irrelevance. This is a policy rather than a legislative issue. The generality of the maritime policy is, of course, another matter, but much will depend on the UK attitude to the surveillance programme and related matters before Mrs May goes to Brussels. So far, the silence is deafening, but this is more than just a loose end. Before the Brexit negotiations are finished, we must know the UK position, and how it will relate to EU plans.